Hey Defenders! Thanks for coming to our party add-ons page. Critter Squad Wildlife Defenders party add-ons are great ways for you to spice up your event! Add-on anything from extra time, extra teachers, SPECIAL GUESTS ANIMALS and much more! At least one party add-ons is added to all defender birthday parties booked. Some of our most popular add-ons are the defender party bags, mini pigs, and our adorable hedgehogs! Rock out like a true Critter Squad Wildlife Defender and have all your defender guests or get the special birthday defender one to wear on his special day! With a good quality T-shirt, an awesome design and a GREAT cause, you can’t go wrong! We have kids and adults sizes! Want all the animals you possibly can? Well once you have chosen your base package you can pump it up by adding extra animals to your event with the defender pump up add-on. Go above and beyond for your child when you are booking their party. Certain parties are just not long enough for some defenders, in that case choosing the More Defender Time add-on is perfect for adding a little extra time to your party, without the cost of a full package upgrade! 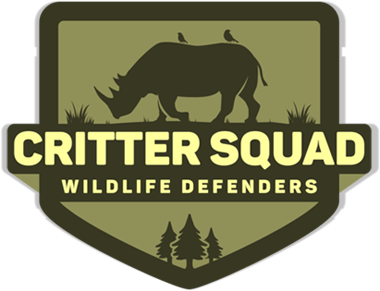 At Critter Squad Wildlife Defenders we have a few animal ambassadors that are either too big and heavy or way to special for us to assign them to regular defender parties. You will find those special guests ambassadors here. Meet our amazing hedgehogs, the infamous Big Worm or the uber famous Micro Mini Pigs. Roscoe the Defender Rhino is a long term member to the Critter Squad Wildlife Defender Team! You’ll mostly see him roaming around at carnivals and fairs helping to spread the word. But, he can also come visit your school or even birthday party! Meet Roscoe our head defender mascot today! Spring and Summer months in Southern California can tend to be a little warm and depending on what time of year you book your defender party they can be a little hot and sunny. We will set up a tent for shade to give your defender party some awesome shade. Perfect for making outdoor events more enjoyable on hot days. 2 tents maximum. One file containing all of the photos from your event for you to keep! Photo shoot session time is additional to party time. Excellent way to extend having our Critters at your event! Guests can take as many photos as they want! We bring the back drop! WE BRING THE CAMERA and TRIPOD! For most of our events we expect the defenders to invite about 30 kids max, but defender parties are much larger. An extra defender educator will guarantee more hands-on time for everyone with each animal. Extra defender educator is a great party add-on for all larger events. All defenders love a fun party bag at the end of their party. Well, Critter Squad Wildlife Defenders will preps the most amazing defender party bags. With a wide assortment of animal and wildlife goodies your birthday defender and their defender guests will leave your party on a high note! Minimum order of 15 bags. We love bringing these for birthday parties to help make your event more festive! Makes planning and prepping for your party easier. It’s your birthday defender’s special day and we want to help you make it as special as possible for them. So, we have a special party add-on just for that. It’s a defender birthday gift! Your Critter Squad Wildlife Defender educator will present the birthday defender with an awesome animal based birthday gift at the end of the show! See skeletons, furs, preserved animals, pinned insect collections and many other artifacts donated by museums and universities. This one-of-a-kind educational display is great for entertaining guests of all ages. Are you doing the petting zoo, tortoise and the hare or the bunny defender party? Well, this party add-on was designed specifically for your defender event! Your Critter Squad Wildlife Defender educational specialist will bring a bag of awesome goodies and food for your animals to enough at your event. Limit 1 bag per hour event. If doing more then one hour then you may do more than one bag.